Cecil Abraham launched this Kuala Lumpur boutique in 2015 after serving as head of disputes at Zul Rafique & Partners for eight years. Arguably Malaysia’s most prominent international arbitrator, Abraham has sat on over 55 commercial cases. He is Malaysia’s appointee to the ICSID panel of arbitrators, and represents the state on the ICC Court and as a member of the Permanent Court of Arbitration. He is a member of the advisory boards of the International Council of Commercial Arbitration and the Kuala Lumpur Regional Centre for Arbitration (KLRCA). Abraham brought a team of three partners from Zul Rafique: Rishwant Singh, Sunil Abraham and Aniz Ahmad Amirudin. Sunil Abraham serves as co-chair of the International Bar Association’s Asia-Pacific regional forum. Various Malaysian government-linked companies have turned to the firm’s lawyers, notably power utility Tenaga Nasional, oil and gas producer Petronas and property group Malaysian Resources Corporation Berhad. The firm also acts for the Attorney General of Malaysia, the Royal Malaysian Police, and the Malaysian Anti-Corruption Agency. It recently represented the Association of Private Hospital Malaysia. Media conglomerates such as satellite TV group Astro also use the firm, as do high-net-worth individuals. 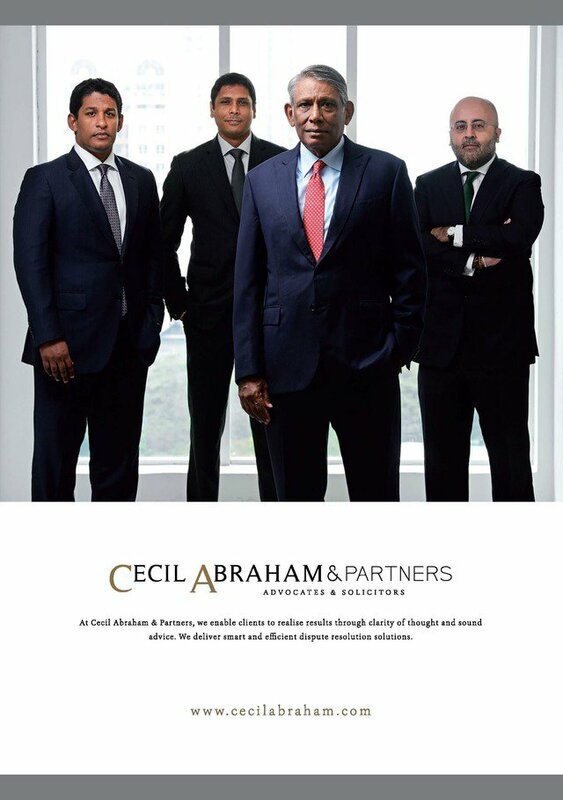 Before the Malaysian courts, Cecil Abraham has been representing Prime Minister Najib Razak in his defence against allegations of malfeasance in public office, including relating to the management of sovereign wealth fund 1MDB. Malaysia’s attorney general, royal police and anti-corruption agency have also turned to the firm for local court matters. Abraham and his team enjoyed notable wins while at Zul Rafique. In 2014, they helped Malaysian real estate company Triumph City win a US$59 million KLRCA award against the Malaysian state of Selangor in a dispute over the termination of a joint venture agreement. The team defeated the state government’s attempt to set aside the award in the local courts but an appeal is pending. Since 2017, the firm has represented the government of Malaysia against a claim brought by a foreign party under the ASEAN treaty. In another case, the team helped an Astro unit prevail on claims that it was not in breach of a non-disclosure agreement, also obtaining US$1 million in costs. The firm has been advising member companies of the Astro group in investment treaty claims against India. The investors say they have been unfairly targeted by a criminal prosecution linked to India’s “2G spectrum scandal” and have sought interim relief against the government. The firm is helping a Tenaga subsidiary to resist enforcement of an award before Malaysia’s federal court. It is representing China Road and Bridge Corporation in a dispute over the Penang Bridge construction, valued at almost US$330 million. The firm is also helping Malaysian energy company Wah Seong resist enforcement of a US$11 million SIAC award. Meanwhile Cecil Abraham has been active on various ICSID annulment committees in cases against Venezuela. He sat on panels that chopped US$1.4 billion from an award in favour of ExxonMobil; reduced an award in favour of oil services company Tidewater by US$10 million; and upheld the dismissal of a US$150 million claim concerning a fertiliser expropriation.